"Smart DJ - Found on the ol' Zune HD, it's described as thus "If you have a Zune Pass, you'll hear a mix of music from your collection and from the Zune catalog if you're near a known wireless network. Otherwise, if you don't have a Zune Pass or if you aren't near a known wireless network, the Smart DJ mix will just include songs from your own music collection.". 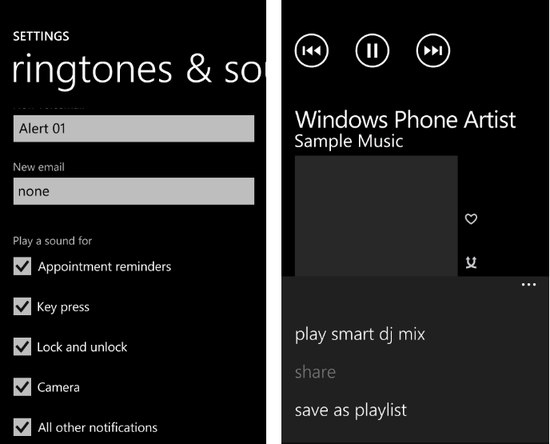 Basically it rivals iTunes Genius and is something us Zune'ers have been wanting for awhile." While they may not be the "hotest" features we can expect to see in the Windows Phone 7.5 release, they will certainly appeal to some people. In addition to the Smart DJ feature referenced in the quote above, another feature is reported to be the ability to turn off the shutter release sound when you are using the camera. Whether that is legal or not is open to some debate (hit the Read link and then scroll down to the comments). I hope that "Mango" will allow the camera to retain the settings I choose. Me too and I'm not trying to be a jerk or anything but I am getting a little tired of hearing people complain about it. Is it really that big of a deal for your phone camera. I could see this if you were talking about a fully functional camera but it is a phone first then a camera second. Right?